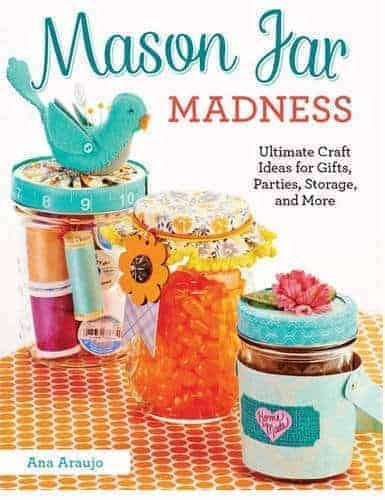 This fun book is a must have for Mason jar crafters! Includes basics on Mason jar crafting as well as dozens of detailed projects with instructions! Indulge Your Passion for Mason Jar Crafts! Take the lid off your creativity with dazzling projects for mason jar crafts! This book is packed with madly inspired ideas for repurposing the iconic glass jar into modern gifts, decorations, storage, and party trimmings. Let crafting expert Ana Araujo show you all of the wonderful things you can do with a mason jar besides canning food. Discover how to add a new twist to everyone’s favorite jar. Ana offers step-by-step guidance on easy-to-learn craft techniques. You’ll find out how to transform the humble jar with decoupage, stencil, glitter, paint, light, embellishments, and more. Then go on to apply what you’ve learned in a treasure trove of fresh, original projects. Mason Jar Madness even shows how to use classic milk bottles to craft vintage charm. Whether you’re planning a wedding, decorating your home, or looking for the perfect present, this book will get you started with whimsical fancies and creative fun.